I have always felt the hand of God. In 1991, God said, You have a book to write. For years, my flesh wrestled with the idea. In 1999, God sent me on a spiritual journey to Hawaii, my heaven on earth. In heaven, I walked and talked with God. The beautiful rainbows reminded me of His promise and He reminded me of the book I had to write. Uncertain what to write, I acknowledged Him and He directed… my path. I vividly recalled my childhood memories, so I entitled the first attempt, The Fruits of My Labor. However, my faith was immediately tested when a thief burglarized my home and stole the laptop that housed the book. In frustration, I concluded that God released me from the book. The devil is a liar. God said, Someone stole your laptop, not your memories. I humbled myself, started over and patiently waited on God. Through many trials and tribulations, He never withdrew His hand. In 2007, sixteen years after God said I had a book to write, I didnt sleep for 7 days straight. The last day of my test measured perseverance. I experienced hell on earth like never before. I called saints and family members to pray and fast with me until the midnight hour. The battle lasted all day, and before midnight my elder and minister came by and prayed with me. I slept that night. The next morning God said, Write and I willingly obeyed His voice. 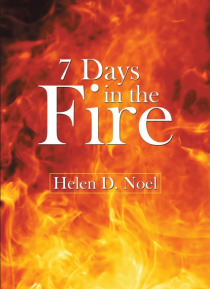 He revealed my past, present and future as I birthed the 7 Days in the Fire chapters in one day. Biblically, the fire symbolizes judgment; the number 7 speaks of completion, finishing, and rest. My soul is at rest. Gods outstretched hand brought me out of the fire as pure gold.